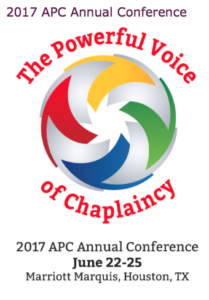 This past June, three members of the IBS community participated in the 2017 Annual Conference of the Association of Professional Chaplains. Rev. Dr. Daijaku Kinst, the Noboru and Yaeko Hanyu Professor of Buddhist Chaplaincy at the Institute of Buddhist Studies, facilitated a panel title “Buddhist Healing Principles: Cross Cultural Research and the Application of Buddhist Teachings and Practices in End of Life Care.” Speakers for this panel were IBS alumni, Rev. Jo Laurence and Alistair Shanks, both graduates of IBS’s chaplaincy program. The panelists presented a definition of healing developed from Buddhist teachings and practices, how this understanding can enrich and impact the practice of end-of-life pastoral care and the training of hospice volunteers, and discussed the relevance of cross cultural research. An audio recording of the panel is available on the APC website here.